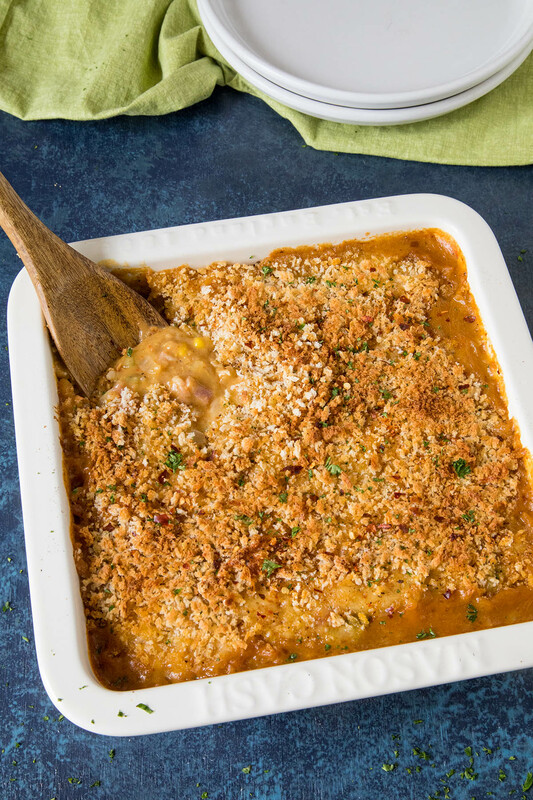 This chicken and corn casserole recipe is perfect for gatherings and holiday meals, and it’s very easy to prepare. Ours is super creamy and spiced with Cajun seasonings. The holidays are on the way, my friends! It’s time to get cooking! 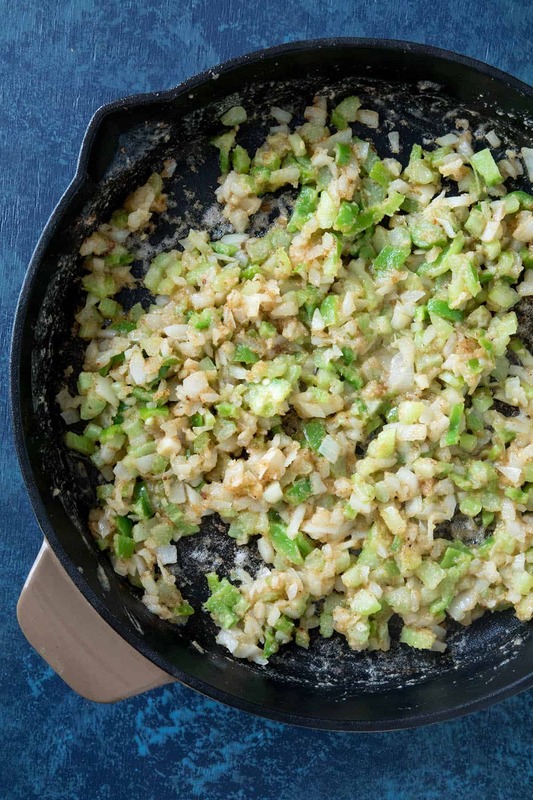 If you’re like me, you want to serve up something hugely flavorful that’s a snap to prepare. 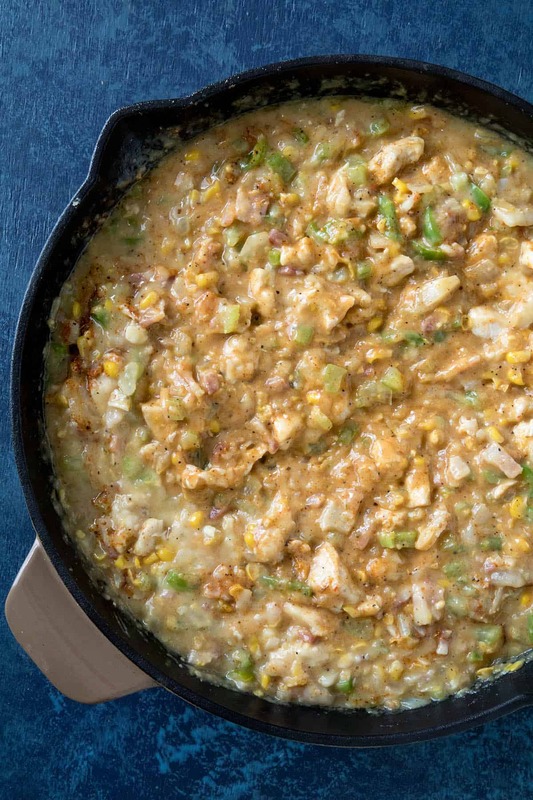 This Creamy Cajun Chicken & Corn Casserole is just the recipe you need because it is sure to warm and win over hearts. 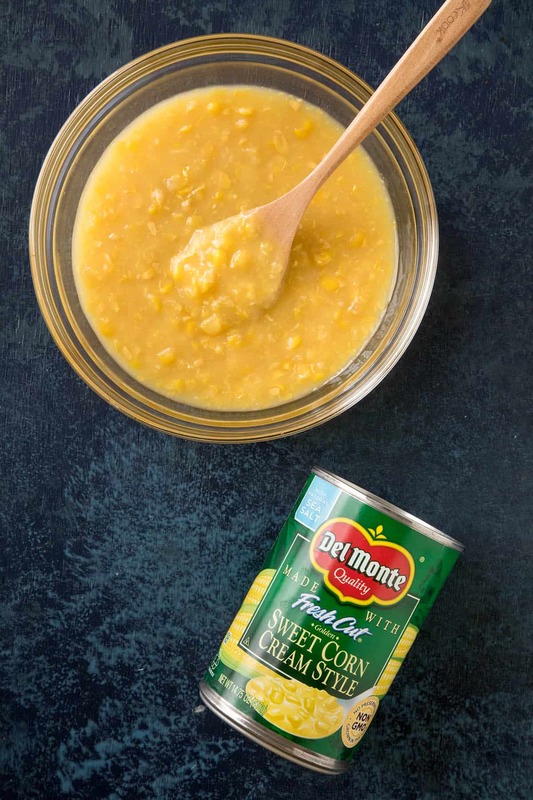 Lucky for me, I’m cooking with Del Monte® Cream Style Golden Sweet Corn. 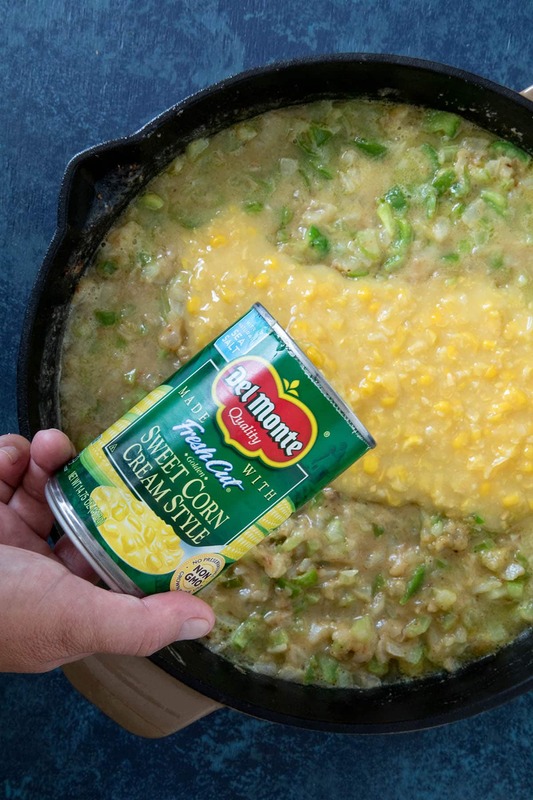 Del Monte® Cream Style Golden Sweet Corn brings both creaminess and flavor to any chicken casserole, and we’re spicing it up with just the right amount of Cajun seasonings to make this recipe a winner. 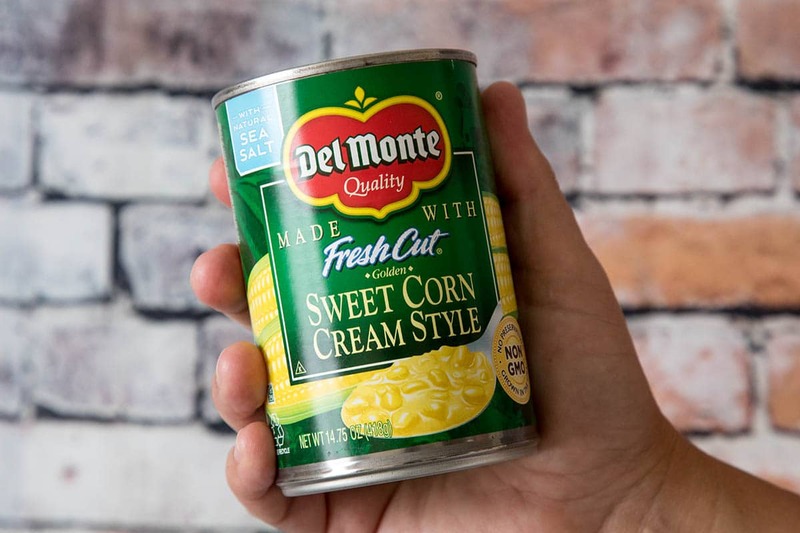 Del Monte’s products are super convenient for your holiday cooking needs, and they’re top quality and picked at the peak of freshness. They grow their vegetables in the U.S. with the care of family farms, many of them working with Del Monte for generations, and they’re packed within 75 miles of the farm where they are picked. And truly, they are delicious. 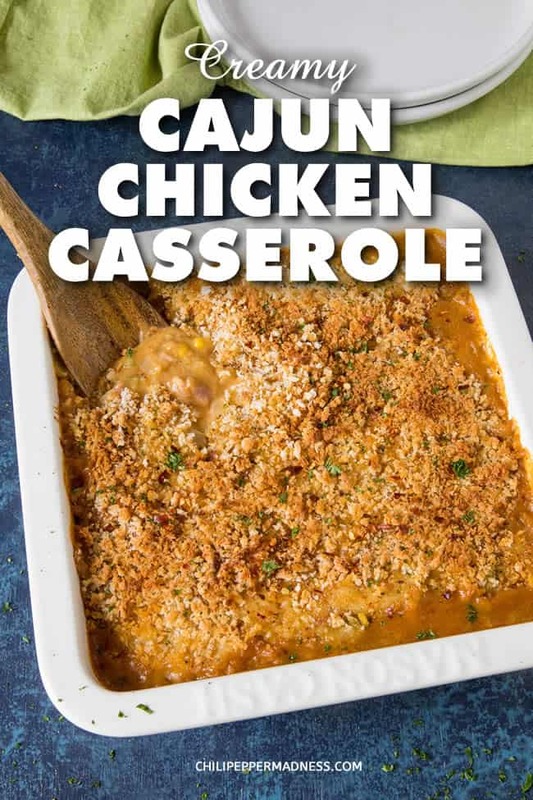 For this particular chicken casserole recipe, I’m taking some techniques from Cajun cooking. We’re going to start off with a roux, which is basically cooking together butter and flour, which will help thicken up the dish. It’s a lot like the start of a Cajun or Creole gumbo, with extra yumminess cooked in. 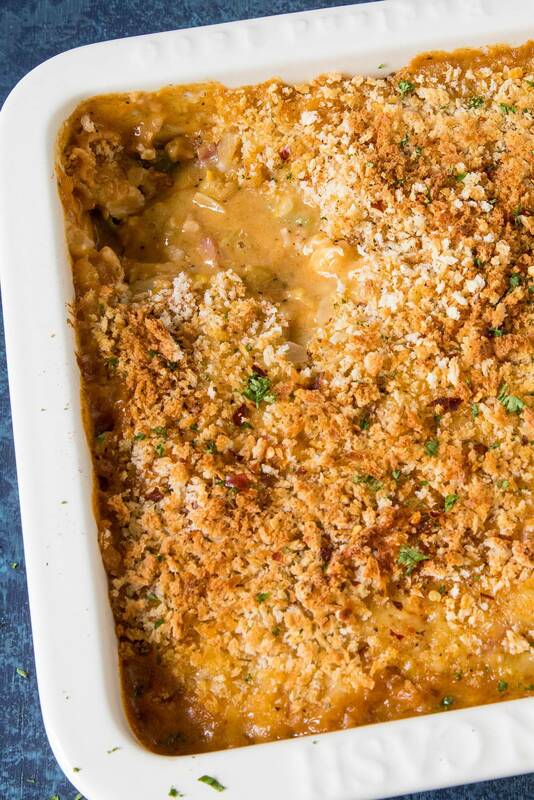 Let’s talk about how we make the chicken casserole, shall we? First, heat a large pan to medium heat. Season the chopped boneless chicken with a bit of salt and pepper (or use some Cajun seasonings) and add it to the pan with the bacon. Cook them down about 10 minutes, until the chicken is cooked through and the bacon is nice and crispy. 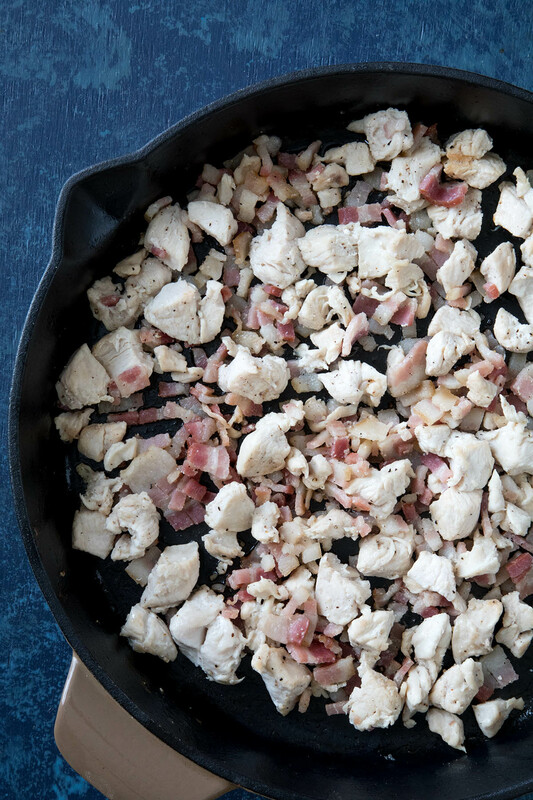 Remove the chicken and bacon and set them aside for now. Heat the pan back to medium heat and add the butter. Stir to melt it down. Add the flour and stir to make a roux. 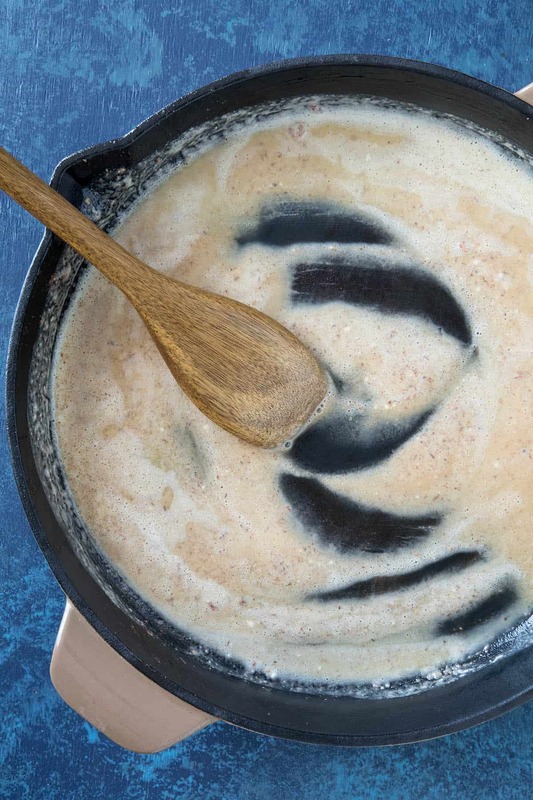 Keep stirring continually about 10 minutes, ensuring the roux does not burn, until the mixture darkens to a light brown. You can cook longer for a darker roux to your preference. Add in the chopped onion, peppers and celery and stir. Cook them about 5 minutes to soften. Add in the garlic and Cajun seasonings and give the mix a stir. Add the cooked chicken and bacon back to the pan. Pour in the chicken broth and cream style corn. Stir to incorporate. Stir in 1 cup of cheese and stir to let it melt through. 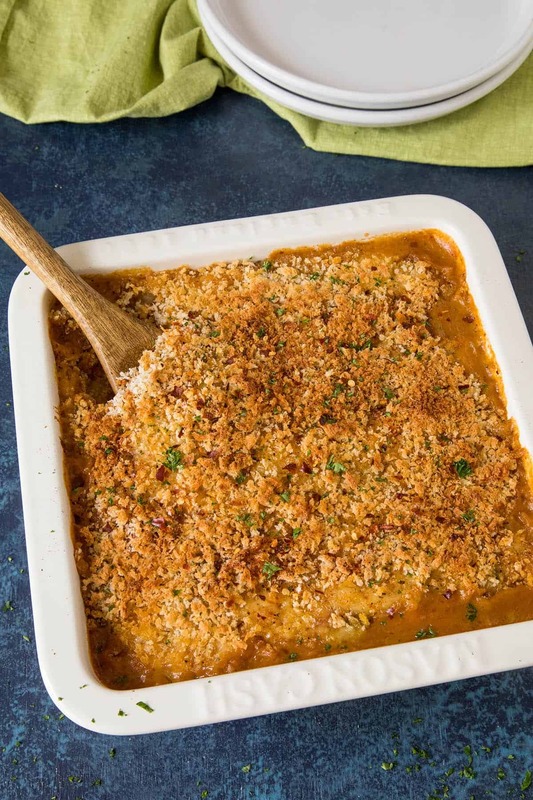 Pour the pan into an 8×8 casserole dish and top with the remaining cheese and panko bread crumbs. 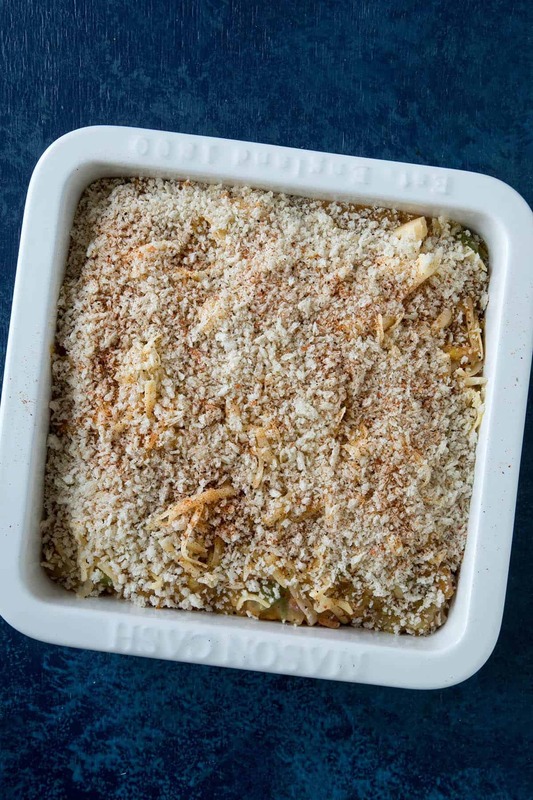 Bake for 15-20 minutes or until the casserole is bubbly and the panko has nicely browned. Serve with fresh herbs and spicy chili flakes. This will serve 6 hungry people, or you can stretch it to 8 servings. It’s so delicious and creamy! Look at the golden color. I love it. 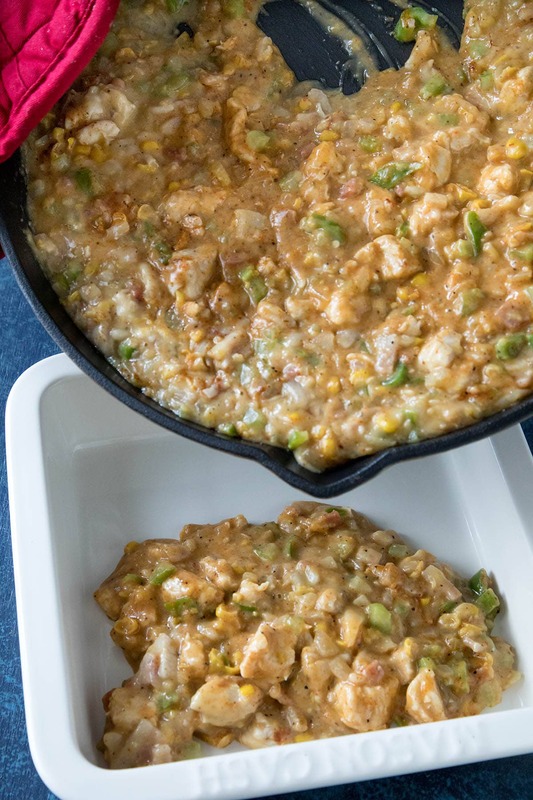 I’ve used chicken and bacon for this recipe, but it’s also great with andouille sausage – giving it even more of that Cajun Gumbo flavor. You can easily adjust this to include more or less chicken, as well as cheese. The more cheese the better! Consider making it with beef or pork as well. Panko works wonderfully for the topping, but consider crumbling crackers over the top – even bread crumbs will do just fine. I used a bell pepper, which has no heat, and a jalapeno pepper for a bit of spice, but you can easily include hotter chili peppers to up that heat factor you’re looking for. Also, consider adding extra Cajun seasonings or a spicier chili powder. Spicy chili flakes are always a good way to spice things up. If you’d prefer a milder version that is still HUGE on flavor, omit the jalapeno pepper and dial back on the Cajun seasoning blend. 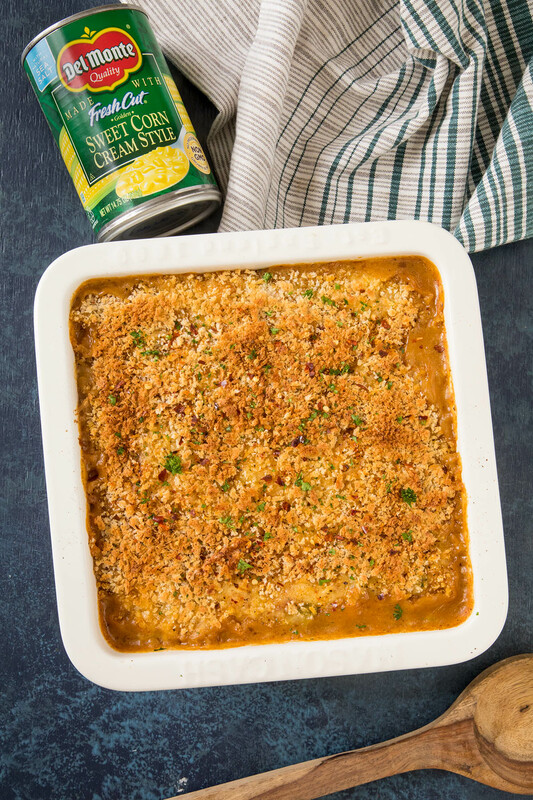 You can check out more Del Monte fall and winter recipes HERE! This chicken casserole recipe is perfect for gatherings and holiday meals, and it’s very easy to prepare. Ours is super creamy and spiced with Cajun seasonings. Heat a large pan to medium heat. Season the chicken with a bit of salt and pepper (or use some Cajun seasonings) and add it to the pan with the bacon. Add the cooked chicken and bacon back to the pan. Pour in the chicken broth and cream corn. Stir to incorporate. Pour the pan into an 8x8 casserole dish and top with the remaining cheese and panko bread crumbs. Bake for 15-20 minutes, or until the casserole is bubbly and the panko has nicely browned. Another hit! 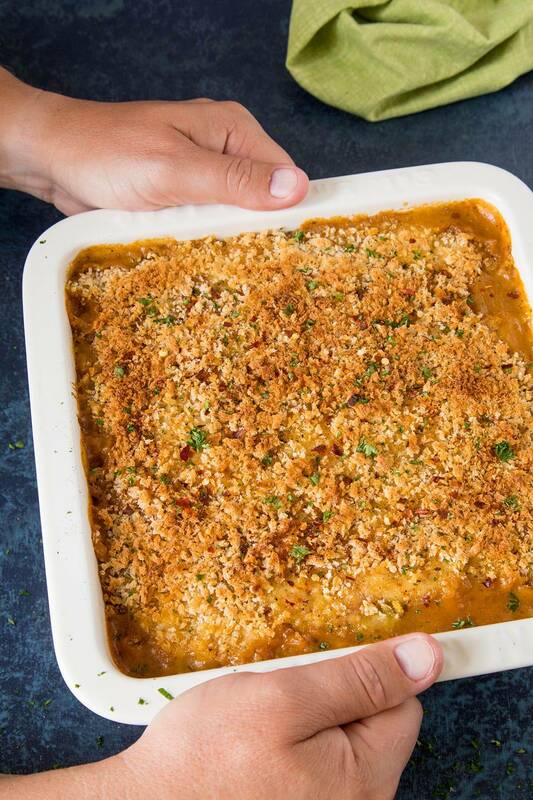 The perfect casserole!